Development of the world’s first-ever 100% fossil fuel-free sailing cargo ship has begun in the United Kingdom and Ireland, following the successful conclusion of primary testing. Rowan Watt-Pringle reports on the engineering design and potential economic viability of a vessel which could revolutionise the transportation of cargo by sea. The fossil fuel-free ships, as seen in this design, will rely on wind power and ancillary biofuel propulsion to match traditional fossil fuel-powered small cargo ships. A scale model of the B9 Ship design was put through a range of simulated test situations in the test tank at the University of Southampton. The model is put to the test in the WUMTIA wind tunnel at the university. The Maltese Falcon super yacht has been sailing with the square Dyna-rig system for the past year. In her first 12 months of operation she sailed 23,310 nautical miles - including two Atlantic crossings - deployed 12,179 individual sail sets, achieved a top speed of 24.9 knots and used wind propulsion for 61% of all its time spent at sea. While the global maritime industry is responsible for three percent of global emissions, it is yet to be subjected to global emissions agreements. With emission levels set to mushroom as more goods are freighted across the oceans, unstable and spiking oil prices also make for an increasingly unpredictable future for worldwide shipping trade. "The design will rely heavily on buy-in from the shipping industry, although this has to an extent already been achieved." The world’s first fossil fuel-free ship, designed by B9 Shipping (B9S), part of the B9 Energy Group, was conceptualised to counteract rising fossil fuel prices and the global challenge of reducing greenhouse gas emissions by providing efficient and affordable low-carbon shipping. A rigorous testing programme conducted at the University of Southampton’s Wolfson Unit for Marine Technology and Industrial Aerodynamics (WUMTIA) analysed a variety of factors, before arriving at a final design. This combines a state-of-the-art dyna-rig sail propulsion system with a Rolls-Royce engine powered by waste-derived liquid biomethane (LBM) – liquefied gas. According to Diane Gilpin, company director: "B9 Shipping’s future-proof coasters can swiftly be brought to market delivering both goods to support the low carbon economy and feasible solutions for the age of sustainability." "The design process is evolutionary," Gilpin enthuses. "We’re combining proven technologies to develop a ‘future proof’ technically and commercially viable small (3,000 dwt) merchant dry bulk vessel." This holistic design process combines technology transferred from offshore yacht racing with the most advanced commercial naval architecture available, as well as incorporating fuel derived from food waste, thanks to B9S’s sister company B9 Organic Energy. Tow tank and wind tunnel research at WUMTIA helped to identify a basic hull design, as well as how this would interact with the dyna-rig system. Exhaustive tests using scale models analysed a variety of performance parameters in order to pinpoint optimum performance efficiencies in a wide range of conditions, while simultaneously ensuring that the design would be able to deliver when it came to essential commercial aspects, including loading and discharge. The outcomes of this recently completed testing schedule, Gilpin says, provide: "Validated data with which to develop a robust economic case (for the vessel’s commercial viability)." This includes, for example, more accurate predictions of time spent under sail on any given route, impacting the amount of LBM required, which in turn impacts operational costs. Steel plates will be used to manufacture the ships’ hulls, a process which has been used to rapidly build all kinds of ships for several years. Gilpin explains: "Think of it as a flat-pack ship kit. The steel is shaped on site at Tata Steel facilities and delivered ‘just-in-time’ to the construction shipyard. The resultant ship manufacturing process is more straightforward and efficient; effectively the steel plates are welded together on site." Steel is the most recycled material in the world and ‘off-cuts’ can be reprocessed at the smelting facility, drastically reducing material waste. "We are working with Tata Steel to improve the green credentials of the steel we buy from them," says Gilpin, "as well as exploring the feasibility of breaking up old cargo ships to make our new ones; using green electric arc furnaces to smelt the steel and adapting coal-powered furnaces to burn ‘bio-coal’ derived from torrefied wood chip." The free-standing and free-rotating dyna-rig sails (originally designed in the 1960s by Wilhelm Prolls) selected for the vessel offer several valuable commercial advantages. "Electronic operation of the sails improves onboard safety, while electronic trimming maximises wind power by working with optimum wind angles," explains Gilpin. ""B9 Shipping’s future-proof coasters can swiftly be brought to market delivering both goods to support the low carbon economy and feasible solutions for the age of sustainability."" "The rig comprises a number of relatively small sails which are easily replaced, meaning the loss of a sail doesn’t compromise overall performance," she continued, adding that because the rig is free-standing there are no lines to clutter the deck and impair loading or discharge of cargo. Gilpin notes that B9 Ships will be dry bulkers and chemical / liquid tankers – pumping cargo on and off – rather than container ships, with the deck space clearly needed to house the sailing rigs. The dyna-rig has already proven highly effective, having recently been deployed on the super yacht Maltese Falcon, which used the sail 61% of the time during its first year of operation at sea. Gilpin predicted 60% wind power for operations involving B9 Ships, with the balance coming from the Rolls-Royce LBM-fuelled engines. B9 Shipping, a subsidiary of B9 Energy Group, is developing carbon neutral coastal vessels that will be commercially viable in terms of price and performance in comparison with conventional oil-powered sea going vessels. Use of LBM in the ship’s engine provides multiple benefits at all stages of the supply chain. Anaerobic Digester production plants follow a series of processes in which microorganisms break down food waste, which is then turned into biofuel in the form of LBM. This is particularly important in light of Article 21 of the 2009 Renewable Energy Directive (RED), which states that in meeting renewable energy obligations: "The contribution made by biofuels produced from wastes, residues, non-food cellulosic material and ligno-cellulosic material shall be considered to be twice that made by other biofuels." "This is precisely why LMB is such an important energy resource to pursue. Using waste delivers a double environmental benefit by avoiding sending food waste to landfills and transforming it instead into a useful alternative to fossil fuel," Gilpin asserts, continuing, "the key value for the overall project is to enable 100% fossil fuel-free performance comparable to (or exceeding) conventionally oil powered ships. The ancillary engine enables adherence to commercially sensitive schedules but without the environmental / greenhouse gas (GHG) emission costs," she continues. Software is also being developed to calibrate the output from the wind / engine for maximum operational efficiency. This is running concurrently with economic analysis work, which has just begun following receipt of the test data. "Firming up the economic case will increase the confidence of our stakeholders, potential customers and collaborators," maintains Gilpin, "in progressing the project to the next step – building a full size demonstrator vessel." Work has already started on a full-scale demonstration vessel, validating the engineering and economic assumptions of the initial vessel design. "This combines a state-of-the-art dyna-rig sail propulsion system with a Rolls-Royce engine powered by waste-derived liquid biomethane (LBM) – liquefied gas." 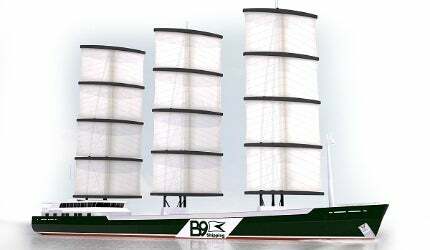 According to Gilpin, the B9 ship demonstrator will be about 100m long with a 55m mast and a draft of about 4.5m. "We will engineer in a retractable centre board (used to maximise performance of racing yachts), helping to optimise upwind / lee shore performance," she notes, adding, "the pay-off between the extra engineering capital cost against the improvements, in perpetuity, from using wind as the principle propulsion resource will be examined in detail as we develop the economic analysis." The design will rely heavily on buy-in from the shipping industry, although this has to an extent already been achieved through partnerships with Tata Steel, Rolls-Royce, Lloyds Register, P&O, Harland and Wolff Shipyard, Graig Shipping (owners and builders) and ship brokers Gibson’s. Gilpin was confident that design and build of the demonstrator could be completed in the next 36 months, provided financing falls into place. With this in mind, she says: "B9S is developing a long-term, ‘triple context’, value-based finance programme." What this amounts to is incorporating wider environmental and social impacts into economic evaluation – an approach already being adopted by numerous significant multinationals to build resilience into their business. Likewise, the project has been given an enthusiastic thumbs-up by UK Shipping Minister Mike Penning, who stated: "The innovative technologies being developed by B9 Shipping are very welcome in demonstrating to the shipping industry and the world beyond that efficient and affordable low-carbon shipping is possible."